After all the pickups, we will be heading to the information point , where all our jeeps meet toghether. We start the route through dirt tracks in the direction of cofete entering the beautiful protected natural park across the mountains where we stop at the mirador to admire the beautiful beach of Cofete . we find several endemic species of cactus that we can observe and photograph. In Cofete we stop for information about famous Villa Winter . If the weather allows us we will stop in one of the nearby beautiful coves to take a refreshing swim (+_ 45 min.) before heading to the Puertito, where we will have time to enjoy a typical Canarian meal in the restaurant. the most southern point of the island “ the hill of love” where we have a unique view of the island. where we first stop to contemplate the spectacular sand dunes of Corralejo. We will continue to Tindaya where we will inform you about its mountain, after we go towards la Oliva where you can admire the old colonels house and see Aloe Vera plantacions. We will go to cotillo, reached its cozy beaches at the low tide, forming many beautiful small lakes and small coves of turquoise waters on the whitest site of fuerteventura, where you can take swim. 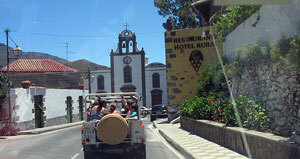 Then we head towards Lajares where we take the offroad and see the volcano Bayuyoon the road to lajares. Information is given and you can take pictures. 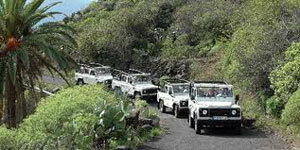 Come with us on our Fuerteventura Jeep Safari and dare to try the unknown on our adventurous route!